Johnston County taxpayers spent thousands of dollars last Thursday, Aug. 16th to allow approximately 270 employees at the Department of Social Services to enjoy a catered meal then a scavenger hunt with door prizes. Department of Social Services Director Scott Sabatino, who has been on the job for 4 months, is defending the cost which includes $21,400 in lost wages and the $4,838 meal. 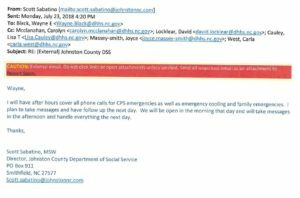 Emails obtained by WTSB News show plans had been underway for weeks by Sabatino and DSS leaders to hold the event during regular office hours. He says holding the event after hours or on the weekend when employees would be off the clock was not an option. 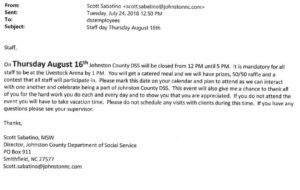 Sabatino received permission from Wayne Black, Social Services Director for the NC Department of Health and Human Services in Raleigh, to close the Johnston County DSS Facility from 12 Noon until 5:00pm Thursday for a “team building training event” at the Johnston County Livestock Arena. A spokesperson for Black denied giving permission for the closing, however emails obtained by WTSB News suggest otherwise. Sabatino also received approval in July from the Johnston County DSS Board, whose members include County Commissioner Chad Stewart and School Board Member Todd Sutton. Both Stewart and Sutton were absent from the July meeting and were unaware of the scavenger hunt until being notified by WTSB. Both expressed concern. At Noon last Thursday, all County DSS Buildings in Smithfield were closed and signs were placed on the entrance doors indicating they had closed for the day. Employees drove to the Livestock Arena off Highway 210 and were treated to a $4,838 catered luncheon featuring fried chicken, hamburger steak, mash potatoes, green beans, rolls, tea and banana pudding. Sabatino told WTSB News the meal cost $4,300 but a Public Records Request for a copy of the invoice showed it was $538 more. The total cost of $4,838 was paid for out of the “Training Budget” for DSS. Those funds are taxpayers money. No employee training took place that day. Sabatino said the “team building” including a meal followed by a scavenger hunt where the county employees were divided into 24 teams. Prizes were donated by Wal-Mart and local merchants. Sabatino said the training event was mandatory for his employees to attend. If they did not attend workers had to use vacation time to take the afternoon off. A few employees decided not to attend and were forced to use vacation time. Remaining in the office to work was not an option from Sabatino. The county DSS director defended his decision saying he received approval from the State DSS Director and the County DSS Board. However, emails obtained by WTSB through a Public Records request show that Black did give permission for the county agency to shut down. WTSB followed up with Black’s spokesperson for clarification on the emails but they did not respond to our repeated requests for more information. Sabatino’s email indicated to Black he would also get permission from Johnston County Manager Rick Hester. Hester said he was never asked for permission to hold the event, he was only notified by the new DSS director it was taking place. An email backs up Hester’s statement. The county manager said the email was not a request for permission, rather notification the event was going to be held. Hester said the DSS Director works at the pleasure of the DSS Board and he has no direct authority over Sabatino. Scott Sabatino said the scavenger hunt also had a secondary purpose and that was to boost morale for his 270 employees. Sabatino said the Department of Social Services lacks adequate space for staff and needs a new building. “Because of space we need a new building. We have people in closets and doubled and tripled up in office spaces. Area counties are paying more than we do and the turnover rate is quiet high,” the DSS Director said. 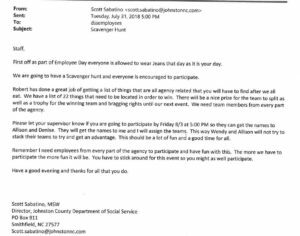 Sabinto said County Commissioners have not funded a new building and would not give his employees more money, so the scavenger hunt was also a way to boost morale for his underpaid staff. 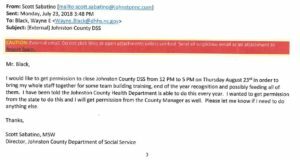 When WTSB made a Public Records Request for documents about the scavenger hunt and meal invoice, Sabatino emailed Johnston County Human Resource Director Lu Hickey asking if the documents we requested were public documents. Sabatino was given the option by the caterer, Stancil’s Grill & Catering of Middlesex, to save $968 in taxpayers money if DSS employees would serve themselves the food. Instead, Sabatino elected to have the caterer serve the food to the DSS staff at the higher cost of $4,838 instead of $3,870. Approximately 1,080 man hours were lost for the event last Thursday, equal to $21,400 in wages paid to employees. Emails show Sabitino and his staff had been planning for the event for weeks, taking away countless more hours from the department’s task of helping and protecting those most in need. Officials could also not determine how many people showed up at the DSS building for assistance last Thursday only to find the doors locked. Sabatino said the event ended by 4:00pm. Employees were not required to report back to work. They were allowed to go home for the day.